This is an interesting article about the famous ‘pitch drop’ experiments, where pitch (bitumen) is passed very slowly through a funnel and the frequency of drops is measured over a period of many years. Such slow experiments may seem more of a novelty than anything, but the researchers behind them are adament that they’re essential for understanding the physics behind liquid glasses, and the waiting is time well spent. This is an interesting post about whether researchers should consider alternative sources of funding, rather than relying on the traditional research grants we’re all so used to. Crowdfunding is looked down on by many as a less reputable form of funding projects, but should it really be thought of in this way? Surely, if the science is attracting funding through this, it indicates that it’s interesting, relevant and has value? What do you think? Thorium – Our Nuclear Saviour? According to this article in today’s Metro, Thorium may be set to replace Uranium as a safer, more sustainable source of nuclear fuel – and China and India are both racing to harness it. The 1950s and 60s saw research into Thorium put to one side, but interest has been renewed in the element recently, and India are hoping to build a Thorium nuclear reactor by 2016. Unlike traditional Uranium-based reactors, Thorium reactors are able to be switched off rather than just controlled, which researchers are saying makes them safer. The waste also stays radioactive for a much shorter time than Uranium, but gives off gamma rays, which are able to penetrate much further than other forms of radiation. Some critics also think that Thorium reactors aren’t viable, and this article from The Guardianpoints out that it has never been tested on a commercial scale. Furthermore, the article claims that so much development is needed to bring Thorium reactors into reality that they may have already been surpassed by other ‘green’ fuel sources by that time. As fossil fuel supplies continue to dwindle and greenhouse gases flood our atmosphere, the need for more sustainable, greener energy supplies has never been greater. However, the scientific community must proceed cautiously with relatively underdeveloped technology such as Thorium reactors. The opinions on this material are very much divided at the moment and only time will tell if it will outshine Uranium and revolutionise the nuclear power industry – what do you think? NSCCS Gaussian Workshop – Apply Now! If any research students or post-docs out there considering using computational chemistry to aid your work or allow for better understanding of the chemistry at play in your research, this workshop may be of interest to you. The EPSRC’s National Service for Computation Chemistry Software (NSCSS) is providing a workshop entitled Gaussian Workshop for Beginners on the 18th and 19th September at the Imperial College London. The workshop is completely free and is aimed at students, such as myself, who have little to no experience in using the Gaussian computer program, and are interested in utilising the software to aid in their chemistry research. If you’ve never heard of Gaussian, it is a computational chemistry package that uses Gaussian, rather than Slater-type, orbitals in order to speed up computational calculations. This allows the user to carry out operations such as DFT calculations, semi-empirical calculations, spectra prediction and structure modelling in order to investigate the compounds they are studying. Computational chemistry is becoming more and more significant in all areas of chemistry, and a high volume of publications involve at least some degree of computational work to back up experimental findings. This is a good chance for researchers to begin to build up some basic skills in this area and add that extra depth to your work – I’ve already booked my place! Applications are open until 15th August and you can find out more here. Brass has been known to the human race for hundreds of years, but this article on the Chemistry World website describes the first ever molecular example of the alloy. Much is known about the chemistry of bulk brass, but understanding of the fundamental chemistry behind the properties of such alloys is still a big challenge to chemists, and molecular models of such mixed metal centres could allow this to be possible. 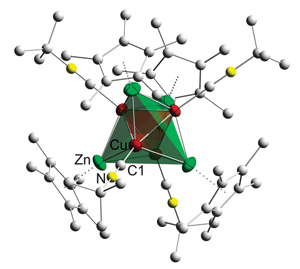 A group of researchers from Germany have utilised the landmark low-valent Zn(I)-Zn(I) compound published in Science by the Carmona group in 2004, combined with an isonitrile-functionalised copper compound to produce a remarkable new Zn-Cu cluster which resembles the inverse structure of bulk γ-brass, and so may give insight into the properties of this material. This is a great blog post from The Sceptical Chymist – part of the Nature Chemistry blogosphere. It relates to a page published in Nature Chemistry which illustrates the absurdity of the phrase ‘chemical-free’ which has no doubt irritated any lover of the chemical sciences for years. I myself feel at my wit’s end by all the television adverts and product packaging which claim their product to be ‘chemical-free’ as the word ‘chemical’ is continued to be demonised by the media and advertising world. We’re bombarded with the notion that ‘chemicals’ are bad – they’re poisons which we want to avoid at all cost and surely any product that lowers there use must be superior. Unfortunately, the general public accept this notion willingly, and are perhaps unaware that thousands of items they use every single day of their lives – medicines, fuel, plastics, cosmetics, food – are all made up of useful chemicals which would be sorely missed if they were removed. In short – the ‘chemical-free’ label is purely a myth. I strongly suggest you take a peek at the article – it won’t take long!